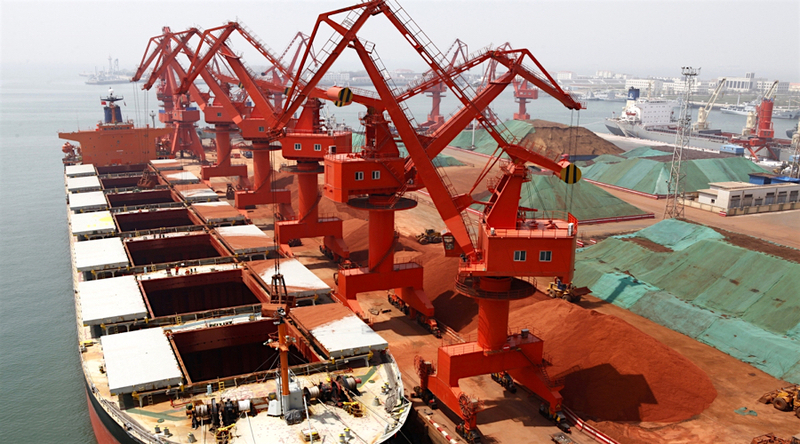 Copper and iron ore prices bounced back on Wednesday despite customs data showing a sharp drop in imports by China as the country's winter anti-pollution program cuts down refinery and blast furnace production. In heavy volume of more than 1.1m tonnes by lunchtime in New York Comex copper for delivery in December added nearly 1% from Tuesday's close to $3.1115 a pound ($6,860 per tonne). Copper hit an intra-day high of $3.25 a pound, the highest since February 2014, mid-October and year-to-date gains for the bellwether metal remain above 23%. October customs data from China showed import volumes of unwrought copper fell to the lowest since April, totalling 330,000 tonnes during the month, down more than 20% from September. While imports were up from September last year, cargoes are down nearly 8% over the first 10 months of 2017 to 3.76m tonnes compared to the same period in 2016. Shipments of copper concentrate in October were up slightly from last year but fell back month-on-month to total 1.37m tonnes in October. Year to date Chinese concentrate imports are up slightly from last year. China consumes nearly 50% global copper output. China consumes more than two-thirds of the seaborne iron ore market and produces as much steel as the rest of the world combined. Beijing's war on smog has concentrated on the country's steelmaking hubs near the capital where mandated cuts of as much as 50% came into effect last month. Imports of high-quality iron ore fines and lump ore from Australia, Brazil and South Africa topped 100m tonnes for the first time in September, but plunged by 23% last month to 79.5m tonnes as steelmakers work through inventory amid lower production. Total shipments for the first ten months of the year is up 6.3% to 896m tonnes. Reuters report usual seasonal factors are also behind the slump. "The steel production cuts should be the main reason (behind the October drop in imports) but at the same time because we have a National Day holiday in October and if you look at historical data, October imports are usually lower," said Wang Di, consultant at CRU in Beijing. "I think imports will remain relatively low (for November and December), but maybe not as low as October. Given the production cuts and the very high port stocks at the moment, I don't think there's very strong demand." The Steel Index benchmark price for Northern China 62% Fe ore was up slightly on Wednesday to trade at $62.50 a tonne. While down sharply from highs struck early in 2017, year-to-date iron ore has averaged $71.10 a tonne compared to $56.50 over the course of 2016.